Every morning here at the Lighthouse Community Center we start our day together as a team with a special time of focusing on God through prayer. We call this time Intercession! We are interceding for various things and seeking God's heart together as a team each morning. We want relationship with God through prayer to be the foundation of all that we do here at the Lighthouse, so this time of prayer in the morning is a wonderful way to start our day and our work with God in the center. On Monday, usually we meet as a house. The Lighthouse Community Center team and the Discipleship Training School (DTS) team and students meet together to listen to someone sharing a word from the Bible and we spend some time praying together. We pray for each other within the Lighthouse Community Center team. We often break into small groups to share personal prayer requests, talk, listen and pray for one another. 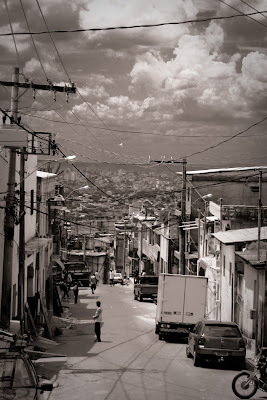 We pray for the community, the Cafezal slum, where we live, serve and share the message of God's great LOVE. The Lighthouse team and DTS pray together again, but this time specifically for the nations of the world. Recently we have been praying often for Japan during our Thursday morning intercession times and also praying for the DTS students as they are leaving on their DTS outreach this weekend. Worship time! We spend time worshipping God through songs and prayer. Here is a video clip of the Lighthouse team worshipping to the song Jesus Lover of My Soul in Portuguese. We also have creative intercession times every once and a while. Eleanor, a team member from England, prepared an awesome team-focused intercession time where we reflected on the gifts each one of us have. Each team member traced his/her own hand and wrote down five gifts that contribute to the good of the team. It was a fun and encouraging intercession time! Here are are the hands and gifts of the Matias Family! Felipe was being a bit silly with one of his gifts. Intercession is a part of our daily life here at the Lighthouse. It is a time where we purposely pray and seek the Lord. Pray with us that the Lighthouse will be a ministry with our foundation always in prayer and in Jesus Christ, our Rock. Through abiding in Him and being in relationship with Him, we are equiped to reach out and share HIS great love to the many children and families in need here in the Cafezal slum.